Happy Boxing Day lovely! Great outfits as always! Both colors are so vibrant and youthful, perfect for summertime! Yellow is such a hard color to pull off but you're rocking it. I love your shorts, the two of them, they seem so comfortable and fresh! Love these summer looks, makes me jealous because its ten degrees here in Kansas City. Love that turquoise purse. One of the things that I love about your outfits is all the prints you wear! I typically tend towards more plaid colors and I love the inspiration to incorporate more prints! You always wear such gorgeous bright colors too which I love! Bright colors are so pretty on you! Thanks! I feel I have a lot of printed pieces, so I'm trying to buy more basics, haha! I think printed pieces suit your style so well! Love the colorful look of you girl! Hope you got all the pieces you wanted in the sales! I am a huge fan of prints as well, especially stripes, but they can be challenging to combine. Color is amazing to spruce up the basics you need. I tend to go for red, but the teal and the yellow look amazing too. Ooh thanks for the sales tips. I had a quick wander round the shops earlier and was fairly uninspired. I'm all about the basics these days too, as well as clothes that actually work in hot weather. Turns out what I thought would be useful from cold rainy UK and what is actually useful is not the same at all! I would be so interested to read how you found the wardrobe adjustment from the UK to Australia, if you wanted to blog about it! Cute outfit! Love that color on you! Love the bright tops! Makes for such a fun and happy look on both outfits. Hope you and your family had a wonderful Christmas! I'm also a huge fan of printed pieces, though I definitely don't wear them often enough - especially in winter, where my style becomes quite minimalist! I love both pairs of these printed shorts, such lovely warm-weather pieces :) I hope you had a wonderful Christmas!! I'm loving these cheery brights, babe! Hope you had a lovely Christmas! That House of Harlow necklace is super fun! I love the aqua color bag. haha, and they make me feel too warm! Outfit of choice today was a bikini to spend the morning in the pool, and even then I'm feeling too hot this afternoon! But storms mean no more pool time at the moment! I love the tank tops. They look so cute! I love the yellow tank top! It looks gorgeous with your skin color! That's funny you say that about the difference between print and solids, because I'm the same way. Yet there are times I need the basics---they just aren't as exciting when I'm buying them--ha ha!! We are going over to a friends for dinner and fun. But I'm not sure I'll be able to stay up until midnight----LOL! haha yes, I'm always attracted more to prints in stores, but need basics when getting dressed! Hope you have a wonderful NYW and do make it to midnight! Love both of these casual chic looks! Thanks for sharing these sales. I love your yellow top and I'm so jealous about the warm weather you have going on there! Anyhoo, just wanna wish you and your family a lovely Happy New Year:) All the best. Wow that's far too cold, haha! Sorry for sharing all my summer outfits as you're in winter! I haven't been too crazy with the sales this year! I've been quite good. That doesn't stop me looking though, ha ha! I love how navy and turquoise look together, and I'm jealous that you get to dress for summer right now while I'm freezing over here! 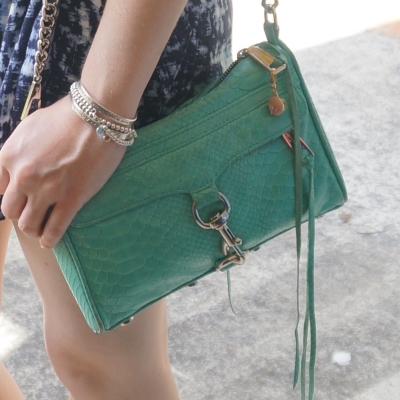 You have found some great picks here that's for sure, and especially like the Rebecca Minkoff aqua bag! Hope you had a wonderful Christmas and wishing you a Happy New Year 2018! Both outfits are lovely but I really love the yellow shirt. It suits you! Hope you're enjoying the festive season. haha hope that you don't feel it too hot when you get back, that's a big temperature difference as it's sweltering in Brisbane! I really need some basic pieces in some nice colors other than white and gray! I love the color of that first tank and it looks great with your bag and that cute skirt. Yellow makes me happy. You look great in both outfits. Mica I adore your summer looks. It really gets me excited for the upcoming spring season. I love the color of the shorts and the fit is very flattering! Thanks for the inspiration always! 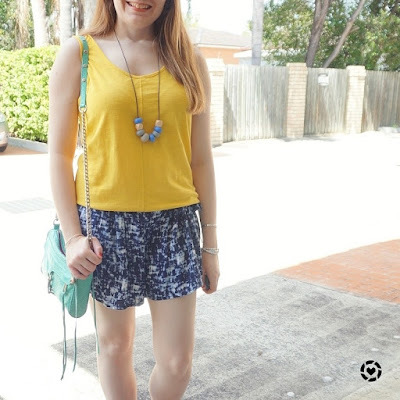 I how you paired the bright tanks with more muted shorts--such a nice pop of color! Such a lovely color! Looks really cute on you dear. Your top is low-key flattering. Love the shorts too. Thank you all for your lovely comments. Hope you had a lot of luck sale shopping, and a merry Christmas and you have a happy new year. You look amazing in printed pieces Mica. Love these shorts and the pairing of color. Looks great on you! Yes I could not agree more, the top and bag look so good together, in the pictures the colors look identical. Great combo Mica. HNY !